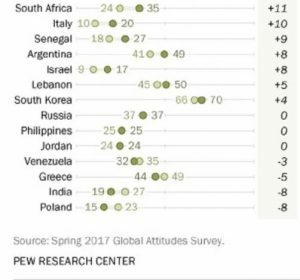 Concerns about American power and influence have risen in countries around the world amid steep dropsin U.S. favorability and confidence in the U.S. president. 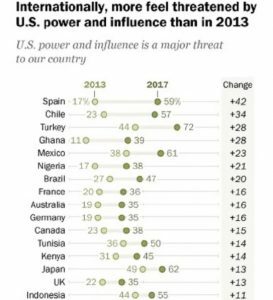 Thirty countries were surveyed by Pew Research Center in 2013 and 2017 to see if US power and influence poses a major threat to their country. Many people also feel threatened by ISIS and climate change, the condition of the global economy, cyberattacks, and refugees from countries like Iraq and Syria. It was also noted that the State Security Services (SSS) which is responsible for counter terrorism sometimes fail to share intelligence report with the Economic and Financial Crimes Commission (EFCC) making it harder to investigate Boko Haram financing.